It's my birthday! I don't have any big plans, except to maybe head over to my LYS a bit later today, but I wanted to share these festive, yarny cakes with you! 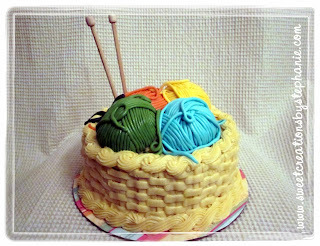 They're all cakes of the edible variety, as opposed to the yarn cakes I normally talk about... Enjoy! 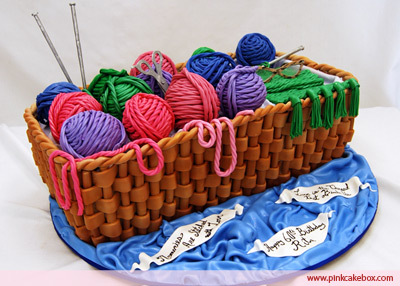 These are some amazingly talented bakers! I love that each cake has a different personality and the interpretations on the theme are varied and special. I'd love to receive a cake like this, but it'd be SO HARD to actually eat it and ruin it! 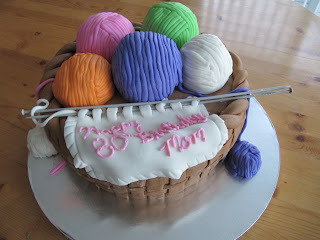 It'd be cool to see someone do little yarn ball cupcakes, too. Or cake pops! I'm not generally big on cake pops, but the shape lends itself to yarny goodness, doesn't it? In other news, I have completed the body (and reknit the cowl) on my Obsidian sweater and have moved on to the evil sleeves. I never wished to have an armless torso until I started knitting... Ah well, I'm going to shred through them and get some images up soon! A long weekend trip is in my future, though, which will briefly interrupt my sweater plans, but I intend to start a hat soon, so I'll have more WIP images up for you! Enter the giveaway if you haven't already! Happy Birthday, hope it's full of wonderful surprises.